. يقدم BreakFree Longbeach Hotel خدمات لا غبار عليها وكل أشكال اللياقة وحسن الضيافة اللازمة لإسعاد ضيوفه. يمكن للنزلاء الاستمتاع بالميزات التالية: تسجيل وصول/خروج سريع, تخزين الأمتعة, صف السيارات, مركز رجال الأعمال, رعاية أطفال أثناء إقامتهم في هذا المكان الرائع. تنعكس أجواء BreakFree Longbeach Hotel في غرف الضيوف.مناشف, تلفزيون بشاشة مسطحة, غرف لغير المدخنين, شرفة/ تراس, ساعة منبه هي بعض الميزات الموجود في العديد من الغرف. يقدم الفندق مجموعة واسعة من وسائل الراحة المتنوعة، كمثل: مركز للياقة البدنية, ساونا, مسار جولف - ضمن 3 كم, حمام سباحة خارجي, حمام سباحة داخلي. يحظى فندق BreakFree Longbeach Hotel بموقع ممتاز وخدمات يصعب منافستها. Re photos in the picture we’re not even close to the unit that we were given. It was old, the cabinet doors were barely hanging on some of the cabinets. The main bedroom didn’t have a remote for the air con so it didn’t work. The air con in the rest of the unit didn’t work for two days. Then the toilet in the main bathroom broke and the lights in the hallway outside the elevator didn’t work several times over the week so that when you got off the lift you could t see where you were going. The pool tiles were dirty and other guests had engraved their names in the filth. Great value for location. We got 1 bedroom apartment for group of 3. Staff are very kind and accommodating. They reply to our emails and call enquiry specially about late check in. It looks like there was a problem with their outside intercom though that’s why it took a while before we were able to get inside the premises after reception time for check in. Overall it was a great stay. We love the indoor heated pool as well. There was a thunderstorm when we arrive in GC. Fantastic hotel, great location, brilliant service, great facilities, it wasn't dirty as such but just abit dusty, like the air conditioning vents and the side tables were abit dusty but nothing you can't fix by giving it a dust down yourself :) otherwise fantastic hotel, highly recommend, fair pricing and I will be staying here next time I come back to the Gold Coast! Thank you for your brilliant service. Oh also.. They do a baggage hold , so check out is at 10am, so expecially if you have a late flight this is very convenient as you check out and they hold your bags, you just have to make sure you come back before 5pm to collect as that's when the staff / reception leave :) amazing. Pros gardens pool area friendly staff handy to surfers and northcliff surf club. Apartment 1901. Cons booked 1 bed apartment months ago. Received phone call day before. No 1 bed available free upgrade to 3 bed but only for 1st night. Then need to move to 2 bed. Sat around pool waiting to move. The room was being cleaned and a plumber was coming to fix toilet. Told us room no and went to room. It was disgusting but wait where is our luggage and plumber. Go back down that was wrong room but the key opened door. Try again right room and luggage and plumber First impressions the apartment was ok. Had to ask for outdoor furniture for patio.there was only 1 little coffee table 2 chairs one of which was torn and shredded. Maintenance man grabbed 3 chairs from pool area No wifi. Aircon in main bed not working Vented air con noisy and not working. Dishwasher didnt wash properly. No vacuum or broom. dvd player. spare pillows or blankets oven dirty rusted plates cook top. Freezer didn't seal. The pools were not heated which was disappointing as had planned to swim. Appartments were good size and mainly clean but perhaps a few aspects could be modernised. Very nice place, most things in walking distance. Only issue we had was the lack of instructions to access after hours, also the intercom does not work for after hours, you can here them, they cant hear you. Made for an unpleasant first night with a little one trying to get in. That aside staff were lovely and rest of the stay went well, lovely view. 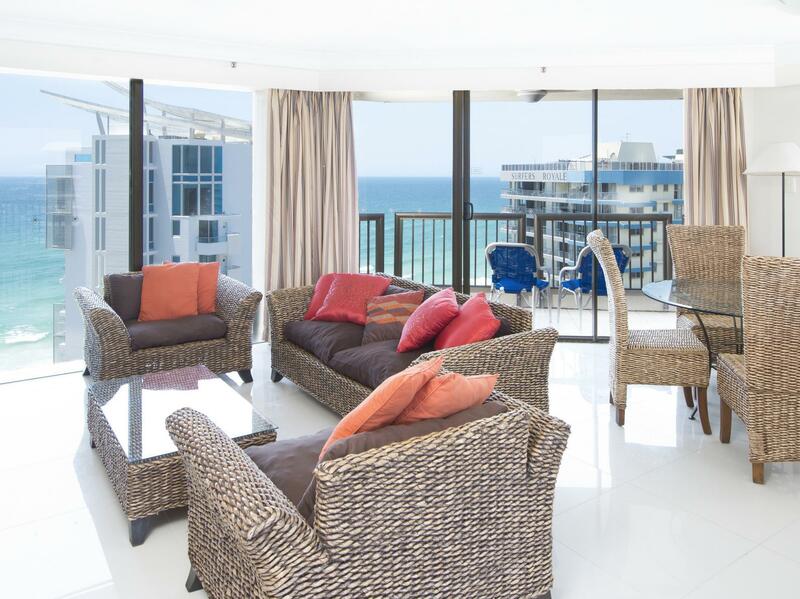 Ocean views were amazing on 26th floor from our three bedroom apartment. 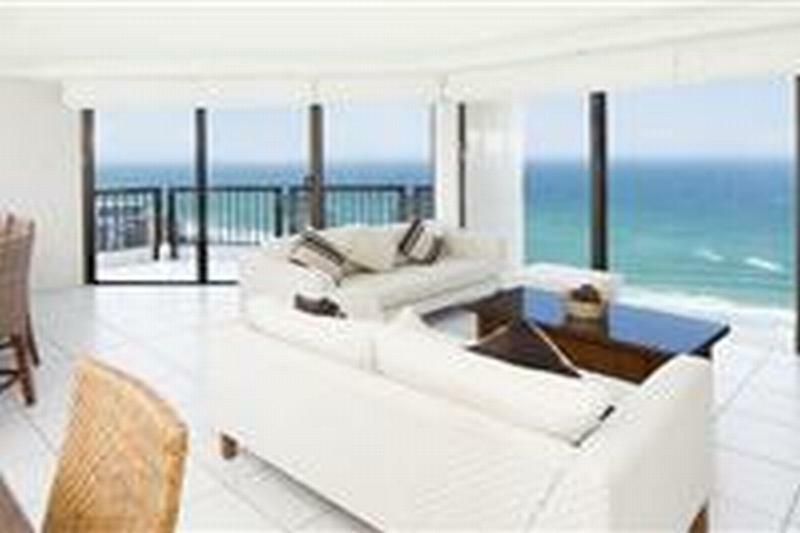 Fantastic location to everything, beach 2 minutes, shops and restaurants 5 minutes. Apartment was very spacious. Some negatives- kettle was broken, we had to phone to have replaced. Air conditioning was not working properly and very cold and noisy. Spa in pool area was cold. We had to purchase pool towels $5 each. Never had to do that before. Wifi had to be purchased at an independant company and it only worked at front door. Reception only available during business hours. No cleaning items in unit and no service for five days. They just expect you to wash and dry your one set of bath towels. Toilet in foyer was locked out of business hours, which was not very handy for people waiting for pick ups. 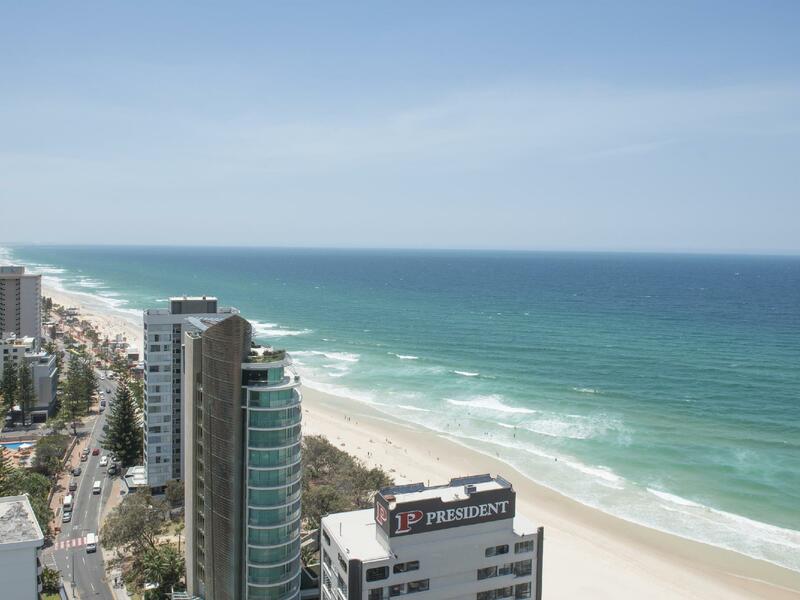 Management really need to improve in these areas as there is so much choice in Surfers Paradise. Most of the other guests we spoke to were disappointed about these issues. More care in details! I’d definitely come back here if I were to travel i a group. 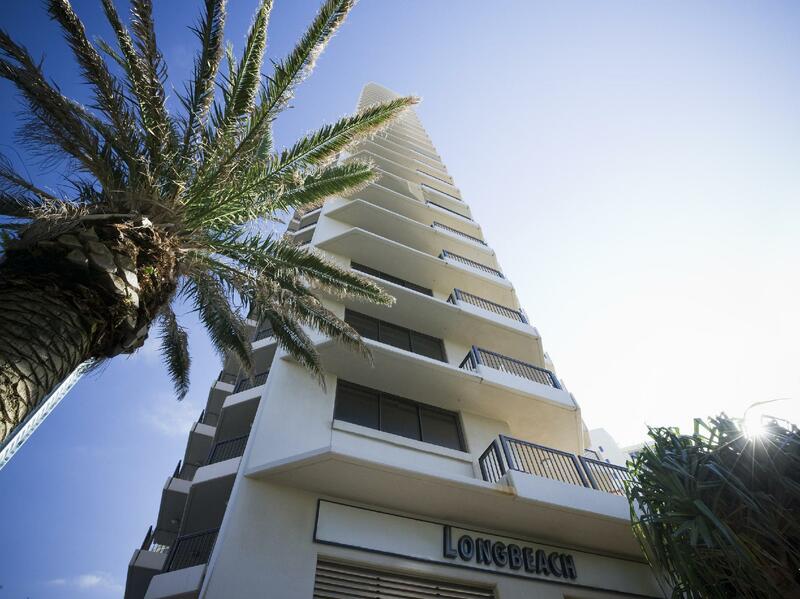 It’s near Surfers Paradise, clubs, near to tram station, etc. Decent Apartment, spacious, amazed especially with the kitchenette. We were very pleased with the apartment we stayed in. We requested a high floor & the lady kindly accommodated our request. And boy was it high! The view is amazing! Nice and roomy the 2 bedroom apartment! Kids loved it! The lady who checked us I was so friendly & happy to assist! our stay here was amazing! we stayed on level 5 and the view was spectacular we couldnt have asked for a better location!! the room was clean and well kept and had all the facilities you would need including a washing machine and dryer aswell as full kitchen! the 3 pools were beautiful aswell as the spa and gym facilities! there is also access to secure parking which is an added bonus and to top it all of the staff at the front desk were extremely helpful and very welcoming, they made us feel at home. we thouroughly enjoyed our stay and were very sad when it came to an end. we have already recommended this place to a few people and will definitley be back! 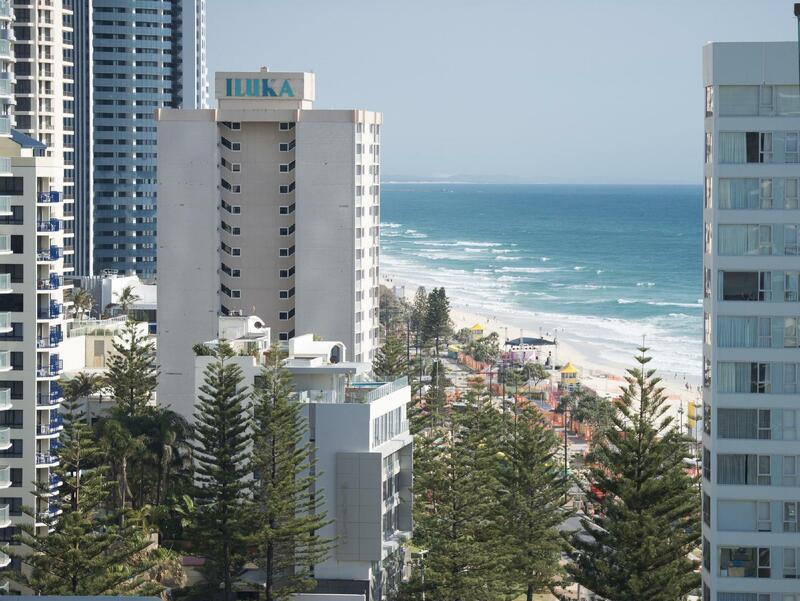 The hotel was situated in the most convenient location for us, near a tram station, around the corner from the Q1 for theme park transfers (also the Skypoint observation deck), 30second walk to the beach, 10 minute walk to the main part of town. The staff were incredibly helpful, accomodating and friendly and the view from the 24th floor was gorgeous. Con: the shower head was loose and sprayed water into all directions. unfriendly staffs, specially receptionist & facilities are old.